LUVORENE I model to Ronnie Wood from the Rolling Stone ! Rolling Stones guitarist and painter Ronnie Wood has taken delivery of a LUVORENE I model personalised with the high art of watchmaking brand of Vincent Bérard in La Chaux-de-Fonds. A choice ambassador but by deliberate choice – the result of a meeting and reciprocal connivance between two artists. What can a rock star and a creator and watchmaker talk about when they meet? About their second common passion: painting. Rolling Stones guitarist Ronnie Wood leads a second life as an accomplished and recognised painter, drawing inspiration for his works from his experience as a musician. Educated at Ealing Art College in London before taking up rock music, he has never ceased to paint parallel to music. His works, which portray in particular the Rolling Stones and other rock and jazz artists or landscapes, have been exhibited at various museums and art galleries throughout the world. 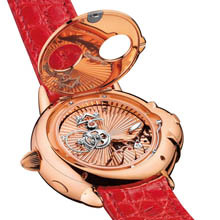 In a similar way, the creator and watchmaker Vincent Bérard has never ceased to paint and sculpt, an artistic activity which is extended into his watchmaking creations. 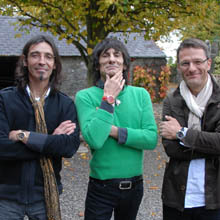 So it is perfectly natural that Ronnie Wood and Vincent Bérard met through painting, rapidly developing a reciprocal appreciation of their art. 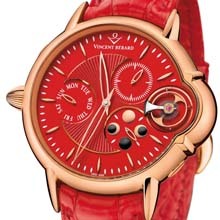 After discovering the watchmaking creations of Vincent Bérard, Ronnie Wood developed a passion for the LUVORENE I model which he ordered in a personalised edition completely in red, his favourite colour, in a red-gold case. It was as a friend and with great enthusiasm that he welcomed Vincent Bérard and Herbert Gautschi, CEO of Vincent Bérard SA, to his home in Ireland when they delivered his LUVORENE I personally on October 18 last.